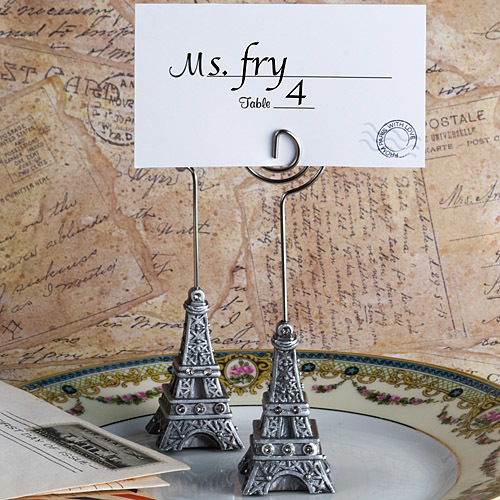 Eiffel Tower place card holders are a perfect fit if you are having a Paris themed wedding! They've also been a bit hit with students having a French prom theme - the holders are perfect to display your favorite photo from the magical evening. Our holders include “From Paris with Love” themed, postage stamp design blank place cards! Each miniature Eiffel Tower is 4 1/2" tall and 1" wide. These poly resin replicas are pewter colored and are adorned with sparkling rhinestones and topped with a silver metal coiled wire designed to hold your place card or a photo/note. Your order is bulk packaged.